Around this time last year, I was charged with my first big-time music interview, when the Sun Valley Center for the Arts brought troubadour and former Men at Work lead Colin Hay to town. I'm not easily ruffled by celebrity. I've interviewed everyone from Winnie Mandela to various presidents, but I really like that guy. I was nervous. I immersed myself in research and found an obscure reference to a glass eye and threw that out in my opening comments. He hung up. Luckily, I decided to hope it was an accident. It was. 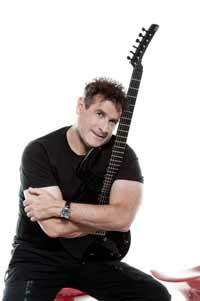 situation with Johnny Clegg, the Bono of South Africa. A messiah for the downtrodden, a musical minister to fans. The Center is opening its summer concert series Monday, Aug. 6, with an appearance by Clegg and his seven-piece band with the all-male township choir Ladysmith Black Mambazo. I only had time to interview the headliner, but here, in a nutshell, is what you should know about Ladysmith. I saw them with Paul Simon as he toured Graceland years ago. Their immeasurable vocals improved on Simon's ethereal sound, giving it a depth beyond his usually knowing, folksy sound. Where before Simon's music teased my soul, this music made my heart beat deeper. Their strength behind their Grammy-nominated albums is their leader, Joseph Shabalala, a factory worker who drew on his farming roots in rural Ladysmith and his South African heritage to name the band 40 years ago. Black is a reference to oxen, the most powerful of all the farm animals, and Mambazo being the Zulu word for axe, the symbol of the group's ability to "chop down" any singing rival. From this foundation, the men present an amalgam of lustrous rhythms and harmonies mixed into the sounds of Christian gospel music. Music historians call them a cultural force to be reckoned with. I first saw Clegg live in Houston when he opened for Tracy Chapman. Unlike Chapman, Clegg didn't—and still doesn't—get much airplay, so he came out a bit of a mystery to us. Still, as an old friend reminded me, the crowd was so taken by Clegg, they actually booed when Chapman took Clegg's place on stage. Going in with that memory of how startlingly forceful his performance was then, I knew what a gift audiences here were being afforded, but for the uninitiated, I wanted to find the right words to encourage curiosity. So as with Hay, I immersed myself in Clegg, coming away feeling even more ridiculous. This guy wrote a protest song about and sang for Nelson Mandela! In plundering the Internet, I also found out that Clegg moved a lot as a child. He had experienced a successful mixed-race community in Zambia, so tagging along with his journalist stepfather as he covered news in the poverty-ridden townships of South Africa in the apartheid era, he was exposed to the power of the people. He found music to be a meeting ground and a pulpit, and after learning his intricate guitar style from Zulu elders, Clegg spent much of his youth in South African jails for standing firm against the oppression of apartheid with his integrated band, the first of its kind in his country. While Graceland might have mainstreamed Clegg's gold and platinum album-winning style, imitation is merely flattering and nothing compared to the real deal. "Human" (on Appleseed Recordings) is Clegg's first new CD to be released in the U.S. in 17 years, since "Heat, Dust and Dreams," recorded with his band Savuka, came out on Capitol Records in 1993. His first several solo CDs were issued in other countries, but not here. The anthropologist sings, dances, and writes. Try as I might to embrace the advice of my predecessor that "they're just people," some, to me, are heroes. They have ruled my emotions and staked permanent claim to my loyalty. They have been there to cry to, to inspire, uplift and incite. The power of their craft is intimidating. I got to pose a few questions to one of those people last week. IME: Have the last few years been about touring the album? build our base on our shows. "Human," the first time in 14 years that you got a producer to produce one of your albums, has quite the range of sound. Was that intentional so that you could cover all the thoughts and topics you'd had in your head? This was after both managements told me that I had exhausted my own production values and needed fresh input. I listened to them and happily a whole new direction emerged. Paul Simon capitalized on your blending of traditions and interracial bands. Did that impact your popularity? "Scatterlings of Africa" hit the U.K. Top 50 in 1983, long before Graceland, and launched Juluka, my first mixed band, internationally. We toured the U.S., Canada, U.K., Germany in that year and up till 1985. Savuka, my second band, rerecorded "Scatterings" and it went to No. 1 in France, Belgium and Switzerland in 1987. We were the biggest-selling foreign act in France, selling 1.3 million albums in 1988 with No. 1 and 2 spot on Top 10 album charts as well as No. 1 and 7 on the top singles charts all at the same time. It was the first for a non-French band. What's great about teaming up with Ladysmith? I grew up on their music and they toured with us in South Africa in 1982. I know Joseph well and he is the foremost practitioner of "Isichathamiya" or "Mbube," as Ladysmith's genre of choir is called in South Africa. Though you will be playing to a somewhat, ahem, enlightened crowd here in Ketchum, this is not exactly a state known for its diversity. Did that factor in to your thinking when deciding to come here? I am a road soldier. I play anywhere and to anyone who will listen. What impression would you most like to make on the audience here? That songwriting is a window into other worlds, emotions and ways of organizing and understanding human experience. How do audiences help you convey your messages? If they carry away with them something they find new or challenging.